Home /Blog/What Happened to Black Unemployment as Unemployment Declined Further? What Happened to Black Unemployment as Unemployment Declined Further? In 2015, CEPR modeled what would happen to unemployment rates for black workers if unemployment fell further. 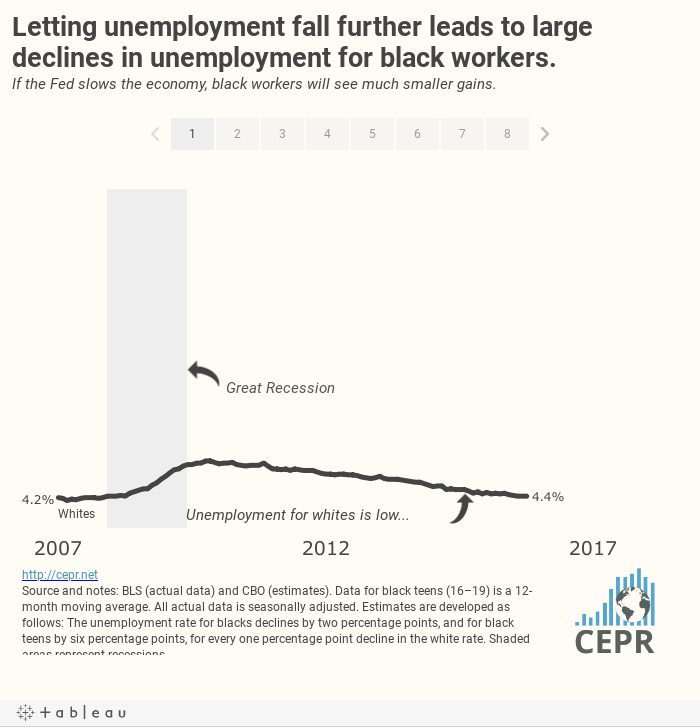 The model found that, if overall unemployment and unemployment for whites specifically, declined more, black workers would disproportionately benefit. In the past, the unemployment rate for black workers has been about two times higher than the rate for white workers, and the rate for black teens has been about six times higher. This means that if the white unemployment rate was allowed to fall one percentage point, the rate for black workers would fall two percentage points and that for black teens would fall six percentage points. Since 2015, the unemployment rate for white workers fell one percentage point. What happened to the rate for black workers overall and that for black teens? The rate for black workers overall fell 2.4 percentage points, and the rate for black teens fell 5.8 percentage points (this is a 12-month moving average since the data for black teens is erratic). In other words, the actual data fits the model very well. The below graphic walks through the model and what has happened since 2015. These results are important in the context of discussions around full employment and interest rate hikes. In the past, most economists believed that the labor market was at full employment at around 6.0 percent unemployment. Below this point, they thought, inflation would rapidly increase to a degree that would cause problems for the economy. Today, many acknowledge that unemployment can fall below 6.0 percent without creating accelerating inflation. However, many still believe the current unemployment rate of 3.9 percent is about as low as unemployment should go. There is a cost to these beliefs, as this model has shown. If the economy is deliberately slowed, by, for example, the Federal Reserve raising interest rates, the people that lose out the most are those who are at a disadvantage in the labor market, like black teens. Many of these same groups were also those hit hardest by the Great Recession. In part because the Federal Reserve has been somewhat cautious about raising rates since 2015, there are over 1.5 million more employed black workers (89,000 of which are teens). If unemployment is allowed to fall further, and President Trump doesn’t derail it with his policy agenda, the benefits will continue to disproportionately accrue to those who have been left behind by the economic recovery following the Great Recession. Given that inflation is still low, it suggests that there is still room for the economy to improve and for these workers to find jobs. Inflation fears and old ideas about the unemployment rate shouldn’t stop them.